Rediff.com » Cricket » Who will win IPL 7? SRK's Knights or Preity Zinta's Kings? Who will win IPL 7? SRK's Knights or Preity Zinta's Kings? We are just a little more than 24 hours away from knowing the winner of IPL 7. This season 60 Matches were played in 47 days. In pursuit of a second title, 2012 champions Kolkata Knight Riders will take on Kings XI Punjab in the summit clash on June 1. Kolkata Knight Riders stormed into the final of the Indian Premier League on the back of a convincing 28-run win over Kings XI Punjab in Kolkata on Wednesday in the first qualifier. 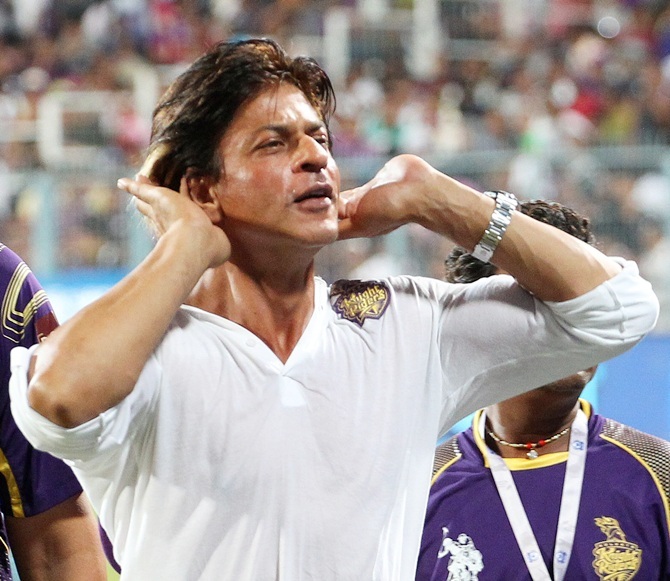 It was the Veer-Zaara match and the Eden Gardens erupted in celebration as Shah Rukh Khan’s Knights won the contest. KKR co-owner Shah Rukh Khan played Veer while Kings XI Punjab’s co-owner Preity Zinta was Zaara in the movie. Eyeing another IPL title after entering the playoffs, Kolkata Knight Riders are on a roll with a seven-match winning streak and bowling coach Wasim Akram has said that the purple brigade has all the "ammunition" to do it again. The Gautam Gambhir-led side were reeling at the bottom half after four losses early in the tournament but fortunes changed midway and it ended second behind table-toppers Kings XI Punjab after league stage. The Shah Rukh Khan co-owned unit has always been accused of not performing up to the potential with a host of stars at their disposal, but this season has been different and Akram opines that it's all about teamwork. Virender Sehwag was at his vintage best as he smashed a power-packed century to guide Kings XI Punjab to a convincing 24-run victory over Chennai Super Kings and a place in the final of the Indian Premier League on Friday night. Kings XI Punjab denied CSK their fifth consecutive IPL final and means that the top two teams this season will meet in Sunday's final in Bangalore. Forget Anushka, Kohli grooves with Ileana; Warne has new girlfriend?